Even if you prepare most of your heart-healthy meals at home, you may find yourself in a situation where you either leave your lunch at home or need to snag a quick bite to eat. Fast food restaurants are usually the quickest way to grab your meal on the go. Unfortunately, they can also add unwanted calories, sugar, and fat to your diet. If you’re watching your lipids and find yourself in a situation where you need to either eat or starve, fast food may be your only option. Try these tips to avoid unhealthy foods that could eventually increase your cholesterol and triglyceride levels. When you think of fast food, you may envision greasy hamburgers and French fries. These foods are cooked mostly in fat, which can introduce extra saturated fat, trans fat, and calories into your diet. If possible, these menu items should be avoided if you are following a cholesterol-lowering diet. Some fast food restaurants may have foods that have been baked or roasted rather than deep-fried. It is always good to ask if these options exist. Additionally, if the fried fish or chicken is the only option you have, you can carefully remove the fried batter before eating it. Some fast food restaurants have adopted a healthier approach to dining. If you’re looking for more cholesterol-friendly menu options, you have a wider selection at some fast food establishments. 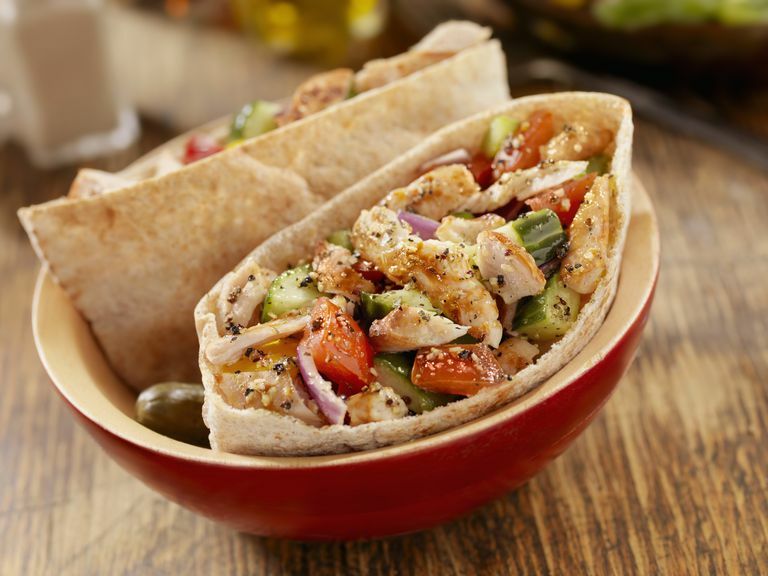 For instance, instead of burgers and fried chicken, you can select foods such as grilled chicken, fresh sandwiches, low-fat wraps, or healthy ingredients stuffed into a pita pocket. Do be careful about the ingredients placed on these foods, since they can also be high in calories. If possible, choose whole grain varieties of breads and wraps. These contain more fiber than their more refined counterparts. Lean meats and vegetables are also possible additions to your sandwich or wrap that can provide added flavor. Some toppings, like mustard or vinegar, are very low in calories, fat, and sugar. However, other toppings, such as cheesy sauces, ketchup, sugary dressings, or mayonnaise, can also contribute more calories to your diet. Many fast food restaurants may automatically add these sauces and dressings to your food in order to save time. Unfortunately, these unhealthy toppings are usually added to excess. To avoid this, you can request that these toppings be placed on the side, then add only a small amount. This lets you retain the flavor while reducing the negative effects. Salads can be an excellent, filling choice if you are following a lipid-lowering diet. Unfortunately, the types of ingredients that you put in your salad can make it either a healthy dish or a cholesterol-raising disaster. Some fast food restaurants have a salad bar that allows you to select your salad ingredients. In other cases, your only choice may be to select a salad that has already been prepared and packaged. If you are faced with the latter scenario, you should select salads that contain plenty of veggies, including lettuce, tomatoes, cucumbers, and carrots. Try to avoid, or carefully remove, any toppings such as ham, shredded full-fat cheese, or bacon, all of which can add saturated fat to your meal. Salad dressings are another potential source of saturated fat, especially when it drenches your salad. One way to reduce that is to use a separate cup and lightly dip each bite into the dressing. Be sure to check your carbohydrate content on any dressings, since many of these are high in sugar. When in doubt, your best bet is to check the nutritional information. Many fast food restaurants have a listing of each food item along with its nutritional value, including calorie, carbohydrate, sodium, and fat content. These menus can be found onsite at the restaurant (either displayed on the wall or behind the counter) or on their website. Eating fast food is not your best choice for a cholesterol-lowering diet. However, by using these tricks and tips, you can reduce the impact when you're in a pinch for some quick food. Making smart choices, no matter where you're eating will help you keep your heart healthy.